I get the impression that Bertram Fiddle has seen it all. He’s been chased by a Giant Man-Eating Tortoise, taken a trip to the Centre of the Earth, discovered the world’s shortest river, hunted down the RhinoBird and shot a Yeti – nearly losing his moustache in the process. He has more than enough stories to share in the autobiography that he has started to write, “A Fiddle Here and There,” but there are more outlandish tales that he will have the chance to scribble down thanks to this pun-ridden episodic point-and-click adventure game. We learn that it has been two months since our intrepid explorer has had the chance to set out on any “Adventurings” in The Adventures of Bertram Fiddle: Episode 1 – A Dreadly Business. Bertram’s wife has threatened to force him to accept a respectable job at Mr. Dulsworth’s Soap Company providing telegramatic advertising if he doesn’t find suitable employment by the end of the day – the steady income used to support her luxurious lifestyle. Unsurprisingly, Bertram doesn’t want to give up his expeditions, and, after being sent to take his wife’s dog Foofy to the Groomery, it soon becomes clear that fate has something else in store for him. When he bumps into a somewhat ominous looking stranger outside his house, the collision results in their bags being “bemuddled.” And so, Bertram gives chase in looking to reunite the owner with his bag and retrieve Foofy in the process. After a quick trip to the Adventurers Club to seek help from Sherlock Holmes and Doctor Watson to hunt for clues about the identity of the bag’s owner, they point out that Bertram is yet to search in the bag. At this point, he discovers that he has been unknowingly carrying around a severed head, which Holmes identifies as the work of London’s most elusive serial killer, Geoff the Murderer. To say any more would start to spoil the eyebrow-raising events that transpire in the episode, but Bertram sets out to track down the criminal before he can strike again. As a point-and-click adventure game, The Adventures of Bertram Fiddle has been built in the genre in a way that leaves few real surprises. You’ll poke, prod and re-poke the colour-packed screens in which you are free to wander, natter to characters and stuff items with otherwise unobvious purposes in Bertram’s inventory. And while Bertram is the main character that you will control, you will need to swap to his trusty Cyclops man-servant Gavin to shove cabinets, bend iron bars and perform other strenuous tasks. The developer has thrown in action sequences as a change of pace, steering Bertram as he makes a mad dash along crowded streets. But, it isn’t enough to shake the feeling that the general puzzles that you are left to solve lack complexity – especially when compared to other games that populate the genre on the Nintendo eShop. Episode 2 – A Bleaker Predicklement has already seen release on Steam, and I would hope to see that these have been broadened out and improved. It all looks and sounds fantastic, at least. 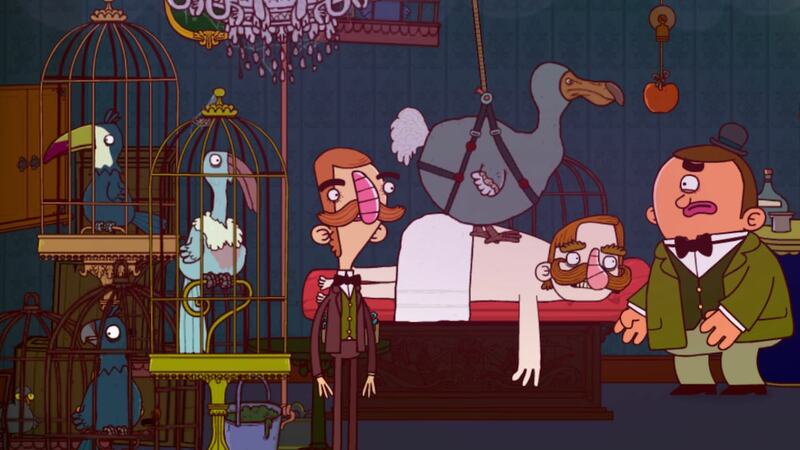 The voice actors have all put in strong performances to help breathe life into Bertram Fiddle’s world, which, in itself, is a gloriously colourful take on Victorian London – the buildings that you enter are packed with many small details compared to the dreary streets. It is thanks to its tremendous character, tongue-in-cheek puns and quirky charm that The Adventures of Bertram Fiddle: Episode 1 – A Dreadly Business starts off on the right foot. The story is a humorous one even if not every joke lands as intended and the puzzles need a little more breadth in approach, but the start of these new “Adventurings” are promising.